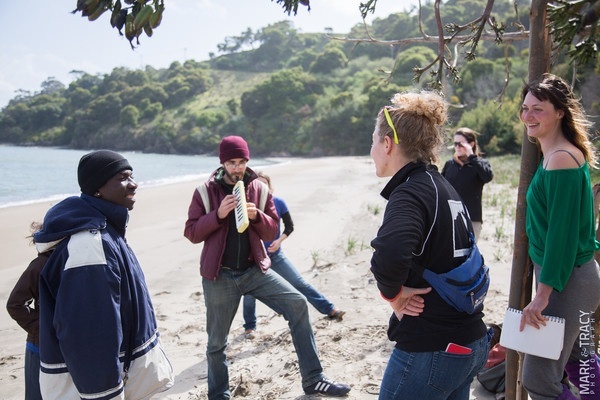 Rebecca Longworth continues to send us postcards from We Players’ production of “The Odyssey on Angel Island”. This one is written by cast-member Maria Leigh, who talks about what it’s like to be a member of the ensemble of this unusual and demanding theater piece. 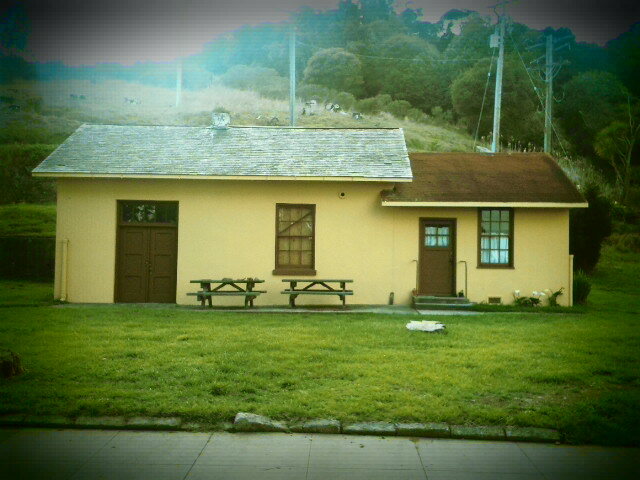 I woke up early on the first day of rehearsal for The Odyssey on Angel Island. I was nervous and excited and had a long commute to work. In the meetings leading up to our first day a mantra of sorts had emerged and was ringing in my ears, ” Don’t miss the boat. Don’t miss the boat. Don’t miss the boat”. And somehow, none of us did despite traveling from cities across the Bay Area. It was a beautiful day in early March, unseasonably warm, and as the ferry churned through the bluegreengraybrown before it, I realized that it was one of those rare moments in life where I was perfectly balanced between before and after but that the moment of falling from one to the other was imminent. The cast and crew had all signed on to spend a third of the year on Angel Island and while I understood what that meant in a technical sense, I didn’t know anything about Angel Island in a practical sense. So the first really surprising thing I learned when I arrived on the island was that people live there. There are currently 27 people living on the island (with six more arriving soon), 18 are parks employees and the remainder are family members. There are thirteen residences on the island, although two are currently unoccupied. The youngest inhabitant is six and the oldest is old enough that the person I talked to about it felt awkward about quoting a number. In partnering with We Players, the residents are not just sharing their space but welcoming us into their home. The number of ways that we intersect as part of this partnership are too numerous to count but the parks and rec staff are always incredible. A case in point: “You need a stake large enough to gouge out a cyclops’ eye? No problem.” The next day a fallen tree weighing 4,500 pounds arrived. We couldn’t have wished for more generous or knowledgeable hosts. And while during the production you will see the fruits of this beautiful collaboration and will see parks staff greeting you along the way, it’s probably worth a couple of return trips to get to see people like Casey Dexter-Lee in her primary role as State Park Interpreter. In this context you can hear about how park residents are the most recent inhabitants of the island in a chain leading back through Asian immigrants, multiple military eras, European explorers, to the Miwok people. In The Odyssey, Mount Olympus is situated on a spectacular semicircular cliff befitting the gods. Nearby is a rickety wood and metal structure where Telemachus kneels in prayer. While architecturally interesting, I didn’t give the structure much thought given the preponderance of cool abandoned structures that are sprinkled around the isle. But as time went on, I learned that the cliffs were actually the edges of an abandoned serpentine quarry and the structure was a rock crusher. During the period that the serpentine quarry was operational, there was also a sandstone quarry just above the beach that is Calypso’s home in The Odyssey. The flat area where you stand to watch the Olympian gods, was once as tall a hill as the cliffs. But in the years between when the quarries opened in 1850 and when they was last used in 1922, the hill was mined down to the level ground that exists today. 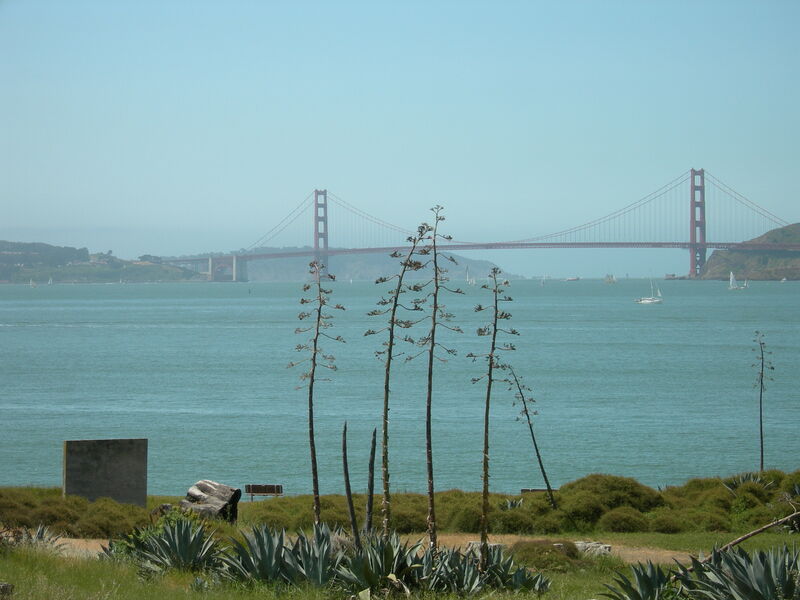 Some of the stone from the quarries was used in Angel Island structures but much of it went into military construction in other parts of the Bay Area. 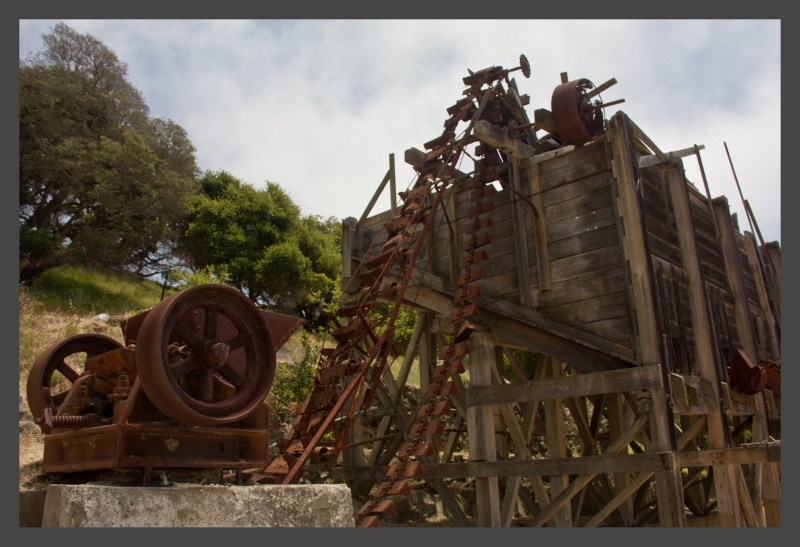 Throughout its operation, state and military prisoners provided much of the labor, and in an ironic twist, stone from this operation was used in the construction of a new fortress – on Alcatraz. As you can imagine (and perhaps have read about in previous posts) there are a tremendous number of logistical concerns in terms of staging The Odyssey. One that is perhaps easily overlooked is how much water travels along the path of the audience in each show. Drinking water, water used in rituals, water used as scenic elements, and more. Each day the production moves approximately 50 gallons of water around the island. Not to mention what individual audience members carry on their person or the end of the day when we line up to take turns in the shower. But where does the water come from? On this point the best person to chat with is Rick Ables, Water and Sewage Plant Supervisor, who is very knowledgeable and articulate on every detail of Angel Island’s water supply. All of the water on the island comes from a protected underground aquifer that is remarkably constant even in drought years. To date there has been no salinity or other intrusion problems from the bay into the aquifer. The water is extracted using four wells ranging in depth from 240-325 feet deep. The water is monitored for coliforms and disinfected using sodium hyperchlorite (more commonly known as bleach). The water on the island is of very high quality and is maintained in accordance with the California Department Public Health standards. The water is then kept in three facilities totaling 1,500,000 gallons. Wastewater is processed through a sanitary sewer treatment plan that eventually releases clean water back into the ground and completes the hydrologic cycle. Another shock for me on the island was seeing spotted fawns bounding delicately through the underbrush on the island. Or standing on Calypso’s beach in the dark and seeing bright eyes peer and a husky gray body hustle out onto the sand. How on earth did deer and raccoons end up on Angel Island? The prevalent theory is that they both walked over when Angel Island was not yet an island. However, as both can swim, it is possible that if the populations died out at any point new animals may have swam out and repopulated. The gap between Tiburon and Ayala Cove is quite narrow and is actually called Raccoon Strait (although this name comes from the HMS Racoon which was the second European ship to visit the island not the adorable swimming bandits). The deer population was also bolstered by the military who repopulated them after overhunting. The deer population currently stands around 60. The raccoons are not tracked. And while you may or may not see deer or raccoons randomly on your travels during the show, they do make a memorable appearance in the company of a certain witch later in the play. I guess what has surprised me most in my personal odyssey with this show is the attachment that I have come to feel for Angel Island. While I love site specific theatre for many reasons – accessibility, vitality, specificity – I have never spent so much time in a performance site. On the island, I have been able to see different wildflowers come in and out of bloom, watched goslings become geese, learned which patches of grass become swampy when it rains. As a cast we have sung in the pouring rain, run in the sun, watched the fog roll in, and the sun rise and set. Each day my roots have gone deeper into our island home, the sites have become increasingly relevant to the actions that happen within them, and my choices are informed by the landscape I am in. Every time we visit a site, it becomes more richly layered with memories and experiences from the visits that came before. I think about all of the life that crossed the same places before me and the lives that will come there after. About the simultaneous constancy and dynamism of place. I think of you, the audience, who will come and those who have already come and gone. That we share an experience but that we also have our own perspective. Every show there are moments where I see things that are so beautiful but will never be seen by anyone else. And while part of me is sad that no one else will ever see these perfect instants, I know that each person will find their own private moments. An interaction with a character that only they see, a perfect perspective that chance brings for them alone, a scent on the wind carried on an intake of breath and then gone. And then that moment will pass and we will be together again, sharing the adventure, traveling together, borne aloft by this sleepy giant that is Angel Island and who is ready to speak to those who will listen. 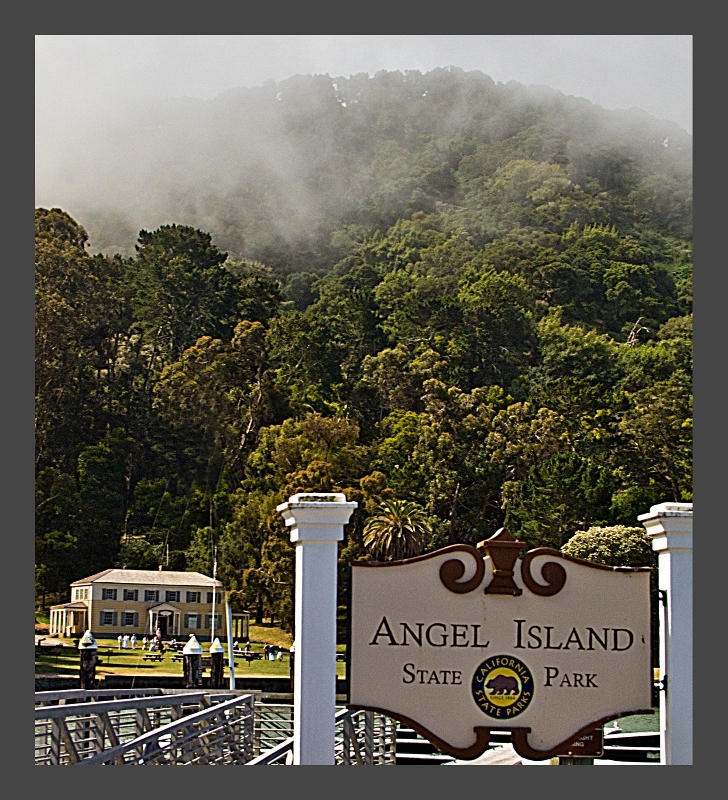 Factual information in the article is drawn from interviews with Angel Island State Park employees and the sites for California Parks and Rec and the Angel Island Conservancy. 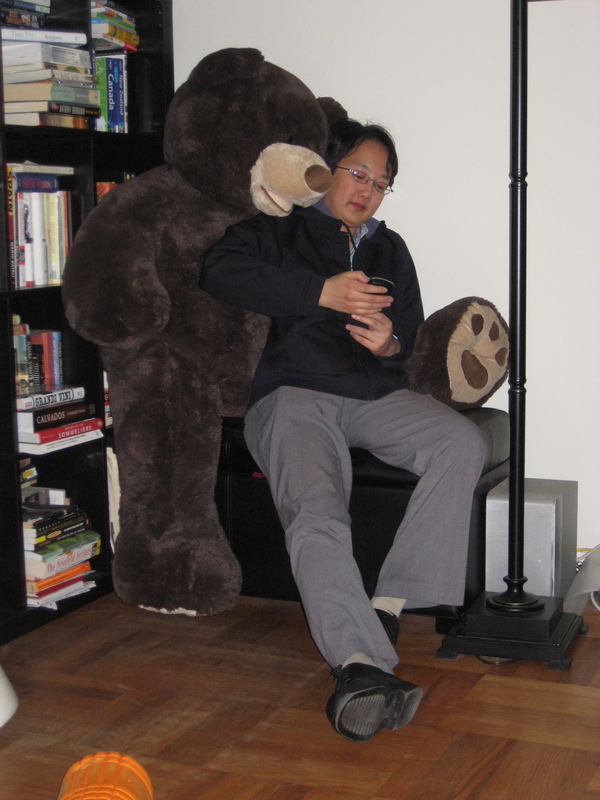 Maria Leigh is a Bay Area actor, collaborator, and cultural philosopher. She is next appearing in a new work entitled, Dirty Laundry, created by The Collaboratory, August 10 & 11, 2012 at The Exit Theatre. Her next written piece will be a one act, Rhea, premiering as part of The San Francisco Olympians Festival III: Titans vs. Olympians, December 19, 2012 also at The Exit Theatre. For more information, please visit: marialeigh.com. Rebecca Longworth takes us on a voyage with the cast and crew of We Players’ Odyssey. Keep your eye on our blog for more updates from this unique production. Want to plug another group, artist or project from the Bay Area’s diverse small theater scene? Write us and let us know! Welcome to Postcards from The Odyssey. 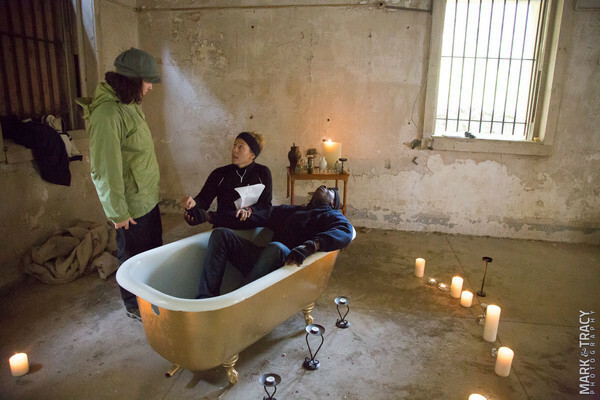 This is the first in a biweekly series taking you behind the scenes of We Players’ current production, The Odyssey on Angel Island, playing May 12 – July 1 at Angel Island State Park. It seems as though whenever I talk about this show, someone asks if there’s an ampitheatre on the island. 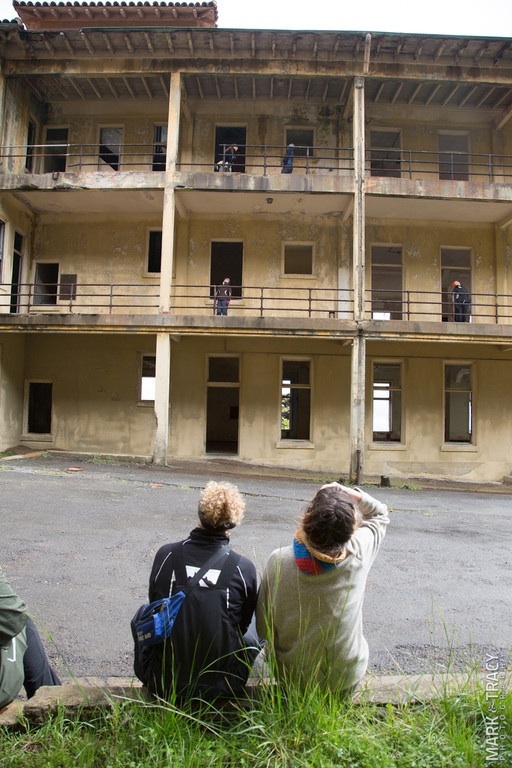 Nope – this Odyssey uses the entire island as a stage: we actors get plenty of exercise running amongst the spectacular natural environs, historic buildings, and decommissioned military installations of Angel Island. The audience will follow us hither and yon, on foot or bike – or, for those that need it, there’s a special vehicle on selected days. They’ll also interact with the performers in many scenes, so some of our rehearsals seem to consist of chatting with imaginary friends while we eagerly await the addition of audience members! As you can imagine, staging a play on a 742-acre island is an enormous undertaking. Members of our production team take trips to the island throughout the week, and our site manager, Dave, actually lives there full time. Each weekend the performers (12 actors and 7 to 10 musicians) join the production team and volunteers on the island for two days of rehearsals. We arrive Saturday morning, rehearse during the day, and spend Saturday night so that we can rehearse Sunday starting in the morning. We take ferries from San Francisco or Tiburon to get to the island, and sleep in bunk beds in a dorm or outside in tents. It’s kind of like summer stock meets summer camp, with spectacular views of San Francisco and geeky mythology references. Luckily, we all like each other a whole lot. But life on the island could be a post in itself… (hint). Right now, I’m excited to share with you some fabulous shots of a recent rehearsal, taken by our most excellent photographers, Mark Kitaoka and Tracy Martin. They’re some of the most fun and friendly people I can think of to spend a chilly Saturday with, and they take gorgeous photos! We have a production-photo-shoot this weekend, and I’m totally jealous that I’m not one of the lucky ones donning costume and looking artfully intense for the camera. 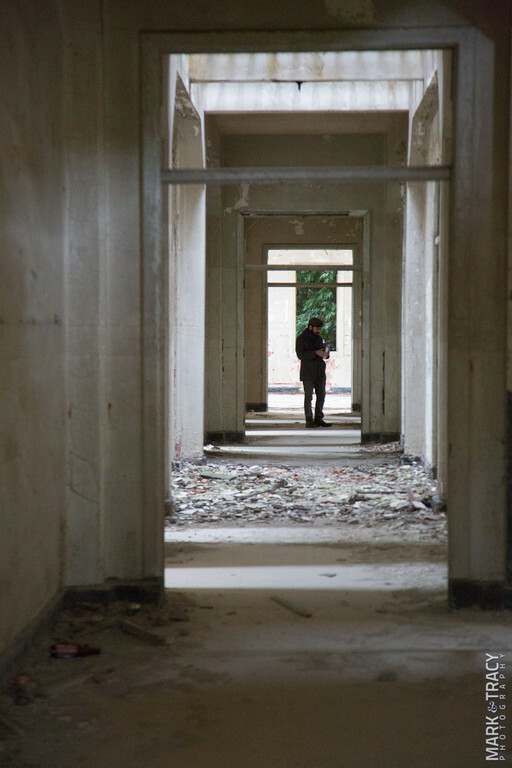 Here we’re rehearsing a scene in the old military hospital near the East Garrison. Julie Douglas, playing Circe, is talking to our director, Ava Roy, about a ritual her character will perform with Telemachus (James Udom, who’s in the tub). Note the fabulous golden bathtub! Natty Justiniano looks to be deep in thought in one room of the hospital. Or he could be checking Facebook. 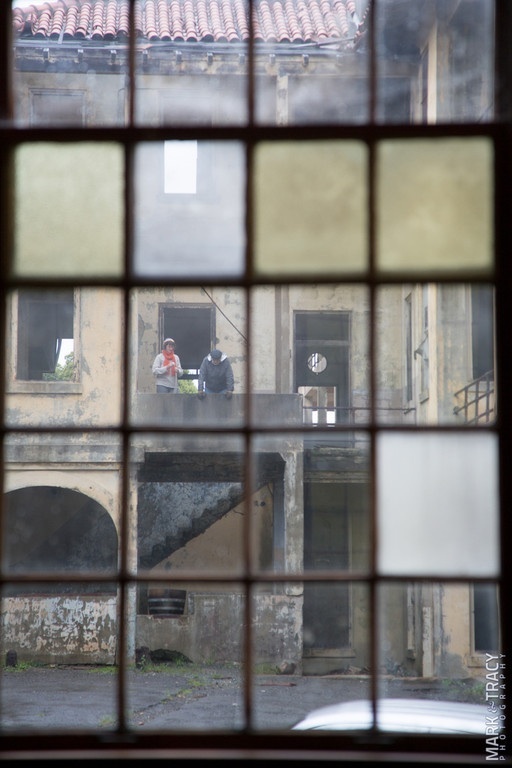 Director Ava Roy and actor Caroline Parsons watch members of the ensemble rehearse on the hospital’s upper levels. 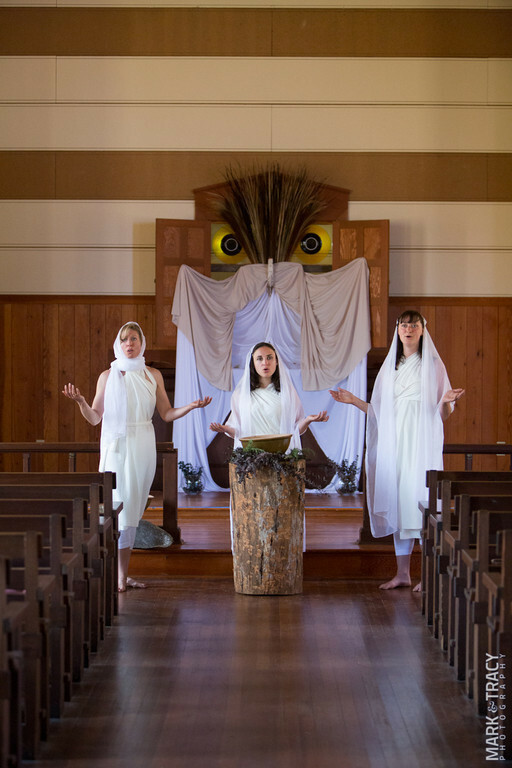 Maria Leigh, Libby Kelly and Caroline Parsons – playing sweet-voiced nymphs – rehearse with music director Charlie Gurke in the old Fort MacDowell military chapel. The military used the chapel to offer services of all varieties; we’re creating a shrine to Athena in it. Actors visible through a window in the hospital. Caroline as Calypso and James as Telemachus frolic on Quarry Beach while Ross Travis as Hermes determines how best to deliver a message from Zeus. It’s always a beach party with Calypso. And Hermes usually has bad news. Couldn’t you just look at that view forever? More song rehearsals at Quarry Beach. Here you can barely make out Maria’s arm behind James, and three of Joan Howard’s limbs behind Charlie, who is playing his awesome and very portable melodica. Ava looks like she’s giggling at something; and there’s Claire Slattery and Caroline Parsons laughing as well. In this scene Caroline plays the nymph Calypso, with backup from other Oceanid nymphs, played by the other ladies. Ticket sales for The Odyssey on Angel Island open TODAY at www.angelislandodyssey.eventbrite.com And please check out www.WePlayers.org, like us on Facebook, and follow @weplayers on Twitter. 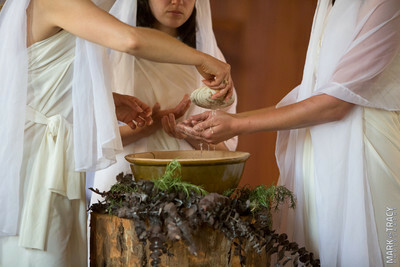 Rebecca Longworth plays Eurycleia, Hera, and Anticleia – among other roles – in The Odyssey on Angel Island. When not performing, directing, or producing, she creates motion graphics for Truc Designs, Inc. Rebecca recently directedBuried Child for Boxcar Theatre, and occasionally blogs about her goings-on at www.rebeccalongworth.wordpress.comor tweets (more frequently) @directorebeccer.